According to the Washington Post, Democrats are continuing to push for an increase in marginal rates, but only on the very rich. A faction of congressional Democrats is making a push to persuade President Obama to consider a compromise on tax policy that would leave only the nation’s 315,000 richest households facing higher taxes in January. 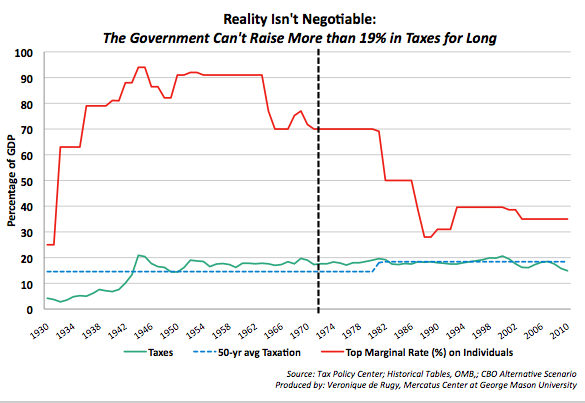 It shows the historical path of federal taxation as a percentage of GDP (using the earliest records available from the OMB) alongside top-marginal-tax-rate data from the Tax Policy Center. From 1930 to 2010, tax-revenue collection in the United States has never topped 20.9 percent, averaging 16.5 percent of GDP over 80 years. This despite the drastic historical fluctuation in tax rates on the wealthiest Americans. Higher taxes discourage the “animal spirits” of entrepreneurship. When tax rates are raised, taxpayers are encouraged to shift, hide and underreport income. Taxpayers divert their effort from pro-growth productive investments to seeking tax shelters, tax havens and tax exempt investments. This behavior tends to dampen economic growth and job creation. Lower taxes increase the incentives to work, produce, save and invest, thereby encouraging capital formation and jobs. Taxpayers have less incentive to shelter and shift income. If you are interested, I recently made the same case (that lawmakers shouldn’t count on increases in revenue to address our debt problem) on Bloomberg TV. However, Hauser’s Law also implies that Republicans shouldn’t count of growth alone to get us out of this mess. They, too, need to get serious about cutting spending.